Some of the most renowned British scholars on Thursday spoke highly of China's reform and opening up policy which, initiated 40 years ago, continues to transform the county itself and impact the world at large. 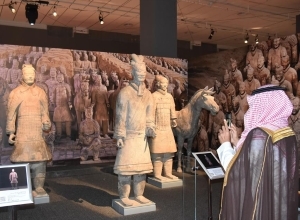 An exhibition featuring Chinese civilization opened on Wednesday at the National Museum in Saudi Arabia's capital Riyadh. A rare exhibition on China's Emperor Qianlong is going on display at the Acropolis Museum in Athens, with exquisite artefacts that will be presented for the first time to the public from Sept. 15 to Feb. 14, 2019. Chinese digital TV firm StarTimes pledges continued efforts to contribute to China-Africa cooperation alongside the continent's transformation in diverse areas like health and education. Many Chinese studies on sites at the complex have been carried out over the years. Artists from Bejing Dance Theater (BDT) gave a superb performance in an Athens theater on Sunday evening. Founded in 1983, All-Russian Children's Center "Ocean," one of the most famous children's camps in Russia, has borne witness to the profound friendship between China and Russia. China Development Bank (CDB), the country's major policy bank, signed a deal Thursday to loan 500 million U.S. dollars to African Export-Import Bank (Afreximbank). China Foundation for Poverty Alleviation (CFPA) has provided scholarships to 1,200 students from 11 universities and degree colleges in Myanmar under "Paukphaw Scholarship" project. About 50 pieces of the intangible cultural heritage of ethnic minorities in southwest China are on display for the first time at the China Cultural Center here on Wednesday. China and African countries agreed to work together toward an even stronger community with a shared future, according to a declaration adopted Tuesday at the 2018 Beijing Summit of the Forum on China-Africa Cooperation. China has made great contributions in supporting African countries in their development, and helped reduce poverty around the world, said UN Secretary-General Antonio Guterres on Monday. In the Egyptian capital Cairo, a large audience applauded wholeheartedly after a Chinese ballet troupe presented a series of short programs including classical and modern ballet shows. In a bid to bridge Malawi's skills deficit, China is partnering with the African country's government to increase the number of technical training institutions in the country. China-Africa cooperation has entered a new era in the fast lane, according to African journalists participating in the 2018 Beijing Summit of the Forum on China-Africa Cooperation. A Chinese documentary about the Belt and Road Initiative (BRI) was presented at the Venice Film Festival on Sunday. The Seventh Ministerial Conference of the Forum on China-Africa Cooperation (FOCAC) was held on Sunday in Beijing. UN Secretary-General Antonio Guterres said on Thursday that China-Africa cooperation is fundamental for Africa's success. In 2017, Zhejiang's ANTEX Fashion Group set a branch in Ethiopia. To build a better team, the Ethiopian branch has sent 93 Ethiopian workers to China for six-month training. The China-Maldives Friendship Bridge, the first cross-sea bridge in the Maldives, opened to traffic on Thursday evening. The exhibition showcased Xinji farmer paintings and Fengning paper-cut works from north China's Hebei Province, attracting many visitors. The center, built with financial aid from the Chinese government in the 1980s, officially opened to public in 1990. Representatives of 12 countries and two international organizations participated in the China-ASEAN New Energy Forum that opened Wednesday in Kunming, southwest China's Yunnan Province. As one of the most senior Kiswahili teachers in the university, Chen has seen major changes over the years and the importance of promoting communication between China and African countries. ​The media center for the upcoming Forum on China-Africa Cooperation (FOCAC) Beijing Summit opened for trial operation on Aug. 29. Midwestern U.S. State of Iowa has held a concert here in celebration of the 35th anniversary of its Sister States Partnership with China's Hebei Province. Sino-Singapore Friendship Library, a joint project between China and Singapore, will open to the public by the end of September in north China's Tianjin Municipality, local authorities said Tuesday. ​China has been Africa's largest trading partner for nine years in a row as major cooperation programs boosted bilateral trade, official data showed Tuesday.